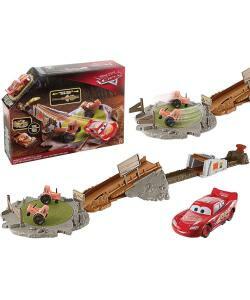 Disney Pixar's Cars 3 race set with true to movie features and themed accessories. In Disney Pixar's Cars 3, Lightning McQueen needs intense training to compete with the "Next-Gen" racers. Now fans can join the action with this iconic Thomasville Speedway race set. 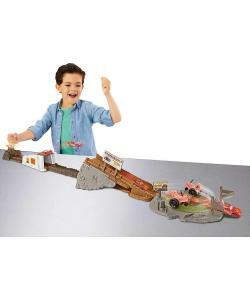 Special features include a launcher, motorized tractor obstacles, themed accessories, a bridge jump, multiple track configurations and a Lightning McQueen vehicle. Launch, jump, land and dodge the moving tractors. Sharpen your skills with three different ways to train, but beware of the spinning tractors who will crash you off the track. 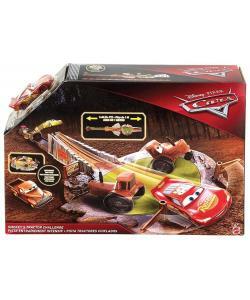 With Smokey's Tractor Challenge Playset, you get Lightning McQueen ready to win the Piston Cup. Other vehicles sold separately, subject to availability.